Renowned for being the largest coral reef system on the planet, the Great Barrier Reef is a fantastic experience for travellers who long for adventure. While exploring over 2,900 individual reefs and hundreds of small islands, you’ll be able to get pure glimpses of nature’s best creations under the water. 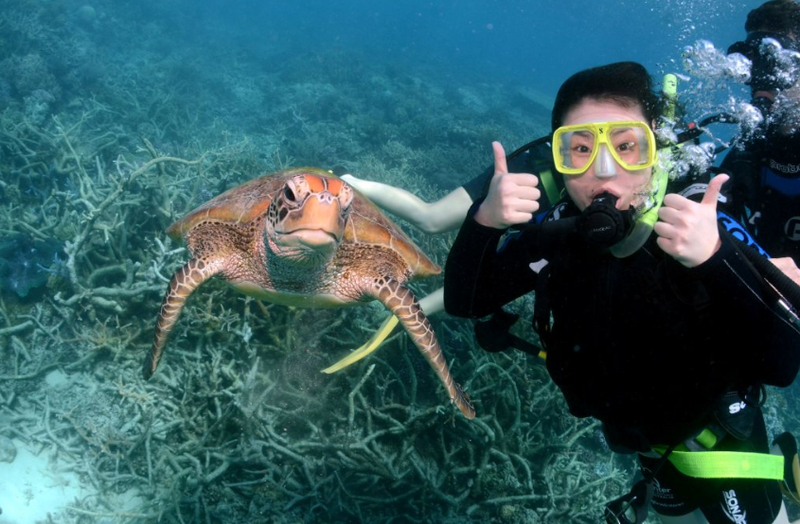 There are many different ways to enjoy the diversity and beauty of the Great Barrier Reef. Cruises, seaplanes, hiking trails, and even small resorts are all available to you. However, there is no better way to truly enjoy these underwater delights than by entering the ocean yourself! Warm, clean waters and incredible diversity of life make the Great Barrier Reef a fantastic combination for divers. The near-perfect conditions attract professional divers from around the world who want to taste adventure here. True professionals know that just one dive on the Great Barrier Reef only affords you a small glimpse of what is truly available. That’s why Cairns Tours offers a three day, two night tour on one of their state-of-the-art dive boats. In this way, you have the most time possible on (and in!) the water. During the three days, Cairns Tours gives you up to 9 guided dives at some of the most beautiful spots available along the Great Barrier Reef. These experts are familiar with the area, and know exactly which dive sites will give you the best view of nature’s finest. Besides the daytime dives, you’ll also have the opportunity to do 2 night dives. This gives you the chance to go below the waves and see the underwater world after dark. Accommodation on one of three premium dive boats owned by Cairns Tours provides the best of comforts. This live-aboard experience allows you to have the most relaxing time out at sea. However, it still gives you plenty of opportunity to explore and discover the world underneath the water. The rooms are air-conditioned, and you can choose between a double and a twin-shared room without extra fees. Seeing the Great Barrier Reef with Cairns Tours gives you everything you need to truly enjoy your visit. You’ll be provided with all dive and snorkelling equipment, along with an experienced guide to show you the best that the Great Barrier Reef has to offer. See the world’s largest reef system as it was meant to be seen. Dive right into this unforgettable experience with Cairns Tours.